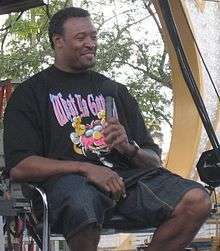 McGinest at the 2008 ESPN the Weekend event at Disney's Hollywood Studios. William Lee McGinest, Jr. (born December 11, 1971) is a retired American football linebacker who played fifteen seasons in the National Football League (NFL). He was drafted by the New England Patriots fourth overall in the 1994 NFL Draft. He played college football at USC. The second of four children, McGinest attended Long Beach Polytechnic High School, where he garnered all-state honors in football and baseball. In football, he earned All-American recognition from Super Prep, Blue Chip and Tom Lemming magazines and was selected to several all-star teams, earning all-city, all-state, and all-region honors as a linebacker in 1989. He totaled 107 tackles, including 18 sacks, two fumble recoveries, four passes defensed, including an interception, and blocked four kicks as a senior. In 2009, McGinest was elected to Poly's Football Hall of Fame. On the court, he earned Long Beach Press-Telegram "Best in the West," All-CIF Southern Section and all-league honors while averaging 14 points per game during the 1989-90 season. McGinest was drafted by the New England Patriots in the first round (fourth overall) of the 1994 NFL Draft. He was one of the cornerstones for New England's success in winning the Super Bowl in 2001, 2003, and 2004. He was named to the Pro Bowl twice, in 1996 and 2003. In Super Bowl XXXIX, McGinest was used in a different manner than his regular role. While he usually lined up as an outside linebacker in a 3-4 scheme, the Patriots moved him to the defensive line as a defensive end in an effort to keep Philadelphia quarterback Donovan McNabb from scrambling. In a 2005 wild card playoff win over the Jacksonville Jaguars, McGinest eclipsed two NFL postseason records—most sacks in a game (4.5) and most career postseason sacks (16), surpassing Bruce Smith. His 78 career sacks rank third all time for the Patriots. On March 15, 2006, McGinest signed with the Cleveland Browns, reuniting with head coach Romeo Crennel, who was the Patriots' defensive coordinator during McGinest's stint in New England. McGinest signed a three-year deal worth $12 million with $6 million in guarantees and bonuses. McGinest stated in an interview prior to the 2008 season that he would be playing his final year of professional football before retiring in the offseason. In July 2009, McGinest stated that he would like to end his career with the Patriots. McGinest owns an entertainment company in Los Angeles called "55 Entertainment", and has had cameo appearances in television shows such as Arli$$ and The Game, and had a small role as a detective in the film I Tried, with rap group Bone Thugs N' Harmony. ↑ "Willie McGinest Stats". ESPN. ESPN Internet Ventures. Retrieved 3 July 2014.